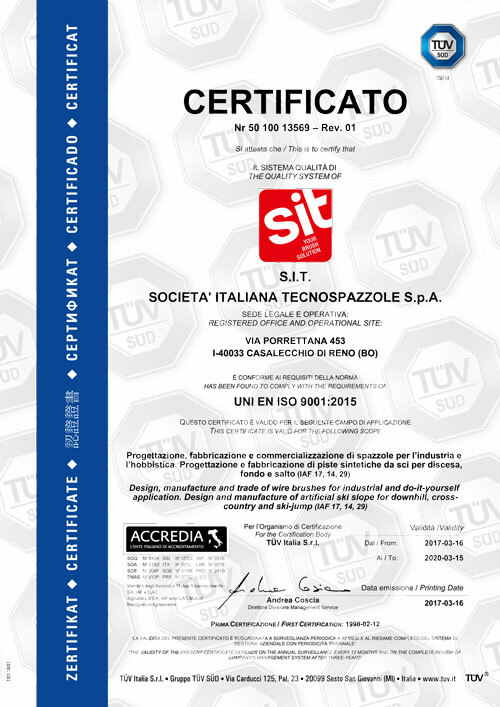 SIT is certified in accordance with the Quality Standard ISO 9001:2015 for the design, production and sale of Brushes for the industry and for hobbyists. Design, production and sale of tracks for alpine skiing, skating and jumping. The certification is a reference standard to guarantee the quality of the process, defining a series of procedures for the control of the productive process, from which depends the level of quality of the product or service offered. Aligning our productive processes to the standard ISO 9001 is the base of continuous improving of the company organization. The certification ISO 9001, recognized and adopted in more than 80 countries worldwide (including all the CEE countries), has the goal of ruling the interchange between the provider and the buyer as far as quality is concerned. The certification allows to distinguish oneself in a market that is more and more quality oriented, guaranteeing to its customers a standard of quality measured and controlled. With its innovative applications, SIT provides technologies and products also to the sports world. The ski tracks "QUATTROSTAGIONI" can be used for alpine skiing, skating, jumping and reproduce effectively the characteristics of a real snow track. The productive process at SIT is in line with the standard of quality and safety of the EU that demand: minimal environmental impact, recycling and separate collection of production wastes, continuous technological update, experimenting and researching at high level.